I am a strong proponent of using authentic materials in the classroom at every level of instruction. On a typical day you can find me carrying items such as magazines, books, menus, and letters to class – even if I am teaching beginners. But every material isn’t right for every class or every student. Sometimes you have to modify realia so it’s more accessible to your students. After all, if you throw them in too deep, they may never want to try again. So the best option is to use authentic texts but make sure they won’t be too far above your students’ skill levels. Here are some ways to find that happy medium between using realia and being realistic. Personally, I’m not a fan of abridged versions of literature. If I’m going to read a book, I want to read it the way the author intended. (I also have an affinity for director’s cuts, but that’s another story.) For my students, however, I’m realistic. A full length novel or article is often simply too much. To make the same material more accessible, I use a shorter length version. With books, it might mean an abridged version (though I still choose those written for native speakers as opposed to those for English learners if I can). For articles, it might mean we only read one section rather than the entire thing. If we are doing research I might have my students use a desktop encyclopedia rather than Britannica’s version. Giving my students less to read is often enough to allay their fears and give them the courage they need to tackle written-for-English-speakers material. When I first heard of showing my students the movie before they read a book, I was appalled. I can’t spoil a page turner by letting them see what happens, and I certainly don’t want to give them all the answers before they even read the book. I’ve learned a lot since then. And one thing I have learned is that it can be good to let your students watch the movie first. First of all, it gives them an idea of the plot and content of the book so they can focus more on the language as they read. Learning and using language is the whole reason they are in my class after all. Secondly, it can make an intimidating piece of literature (even in abridged form) more accessible and approachable. Why not try this with your students before you try your next novel and see how much of a difference it can make. You probably do this without even thinking about it. Teach your students the things they will need to know before they read the selection you have chosen for them. This might mean grammar structures, and it might mean vocabulary. One of my favorite things to do when teaching new vocabulary is give my students the sentences in which the target vocabulary appears in the text and let them get an idea of the words’ meanings from that context. Then, without giving them the answers, I give them a list of all the definitions and see if they can match each vocabulary word with its definition. Finally, I have them look up each word in an English only dictionary. By that time, my students have a really good idea of the words’ meanings, and when they encounter them in the reading itself, they have already seen the sentence and know what it means. Often reading material has clues right on the page. These clues include headings, pictures, and diagrams. Take some time with your students to look at these items and then discuss what the reading selection might be about. Chapter titles can work this way as well. If what you are reading does not have headings, write some. Give these to your students on a separate paper and have them discuss what they think they will be reading about. You can also give them an outline. Then as they read they will compare their predictions with what is actually on the page. Though it may sound silly, sometimes the font of a reading selection can influence how your students feel about it. By simply changing the font to a larger size, your students may find the text to be more approachable. You can also give students one page at a time, one section at a time, or one chapter at a time. Students will often feel able to tackle one page but not ten. Giving them shorter selections lets them work their way through the reading passage in smaller, manageable, and realistic chunks without putting them off. You may not be a writer, but that doesn’t mean you can’t add to your text to make it easier for your students to understand. Sometimes the transitions between ideas are subtle in a reading passage, and your students may pass by them without making the connections the author intended. Try adding transitional phrases which show the logical connections between ideas to your next reading assignment, phrases such as the following: on the other hand, in addition, after that, and as a result. These phrases may help your readers make the logical connections between ideas more easily so they give more mental energy to the use of language rather than the authors’ ideas. Want to give your students even more of a leg up? Review the phrases and their meanings before tackling the modified text. The more you use authentic text in class, the greater skill your students will have when they encounter similar materials in the English speaking world. 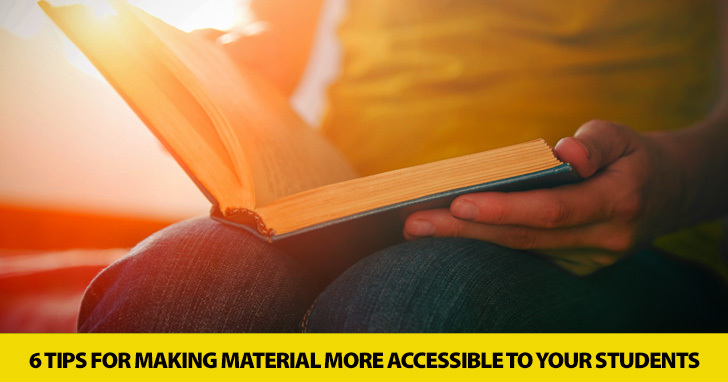 Just remember that as a teacher you have the freedom and the responsibility to make these materials more accessible to your students to help them succeed both in the classroom and outside of it.